We’d love your help. Let us know what’s wrong with this preview of The Skeptic and the Rabbi by Judy Gruen. To ask other readers questions about The Skeptic and the Rabbi, please sign up. Judy Gruen's memoir of her journey to religious Judaism is an ernest tale of personal struggle mixed with some welcome notes of self-deprecating humour. It also happens to be very readable: I finished it in almost one sitting! I particularly liked the way she framed her journey as a kind of internal struggle between her two sets of grandparents--one traditionally religious vs. the other anti-religious--and how she ultimately resolved that tension in her own life. The Gemara in tractate Yoma 35b famously extols the triumphs of various Torah personalities who surmounted tests, obstacles and circumstance to lead meaning-filled lives. “Hillel obligates the poor,” the Gemara relates, while “Rabi Elazar ben Charsom obligates the rich…” Despite backgrounds and limitations that would generally preclude one from singular devotion to Torah study - extreme poverty on the one hand and unimaginable riches on the other - Hillel and Elazar Ben Charsom did not desist fr The Gemara in tractate Yoma 35b famously extols the triumphs of various Torah personalities who surmounted tests, obstacles and circumstance to lead meaning-filled lives. “Hillel obligates the poor,” the Gemara relates, while “Rabi Elazar ben Charsom obligates the rich…” Despite backgrounds and limitations that would generally preclude one from singular devotion to Torah study - extreme poverty on the one hand and unimaginable riches on the other - Hillel and Elazar Ben Charsom did not desist from seeking out the truth and living it. Judy Gruen, in turn, obligates the skeptic within each and every one of us through her highly personal and compelling memoir. The Skeptic and the Rabbi candidly details the struggles Judy, a child of the ‘60s and ‘70s counterculture movement, faced on her path to Torah observance, from grappling with questions of G-d’s existence and the Torah’s veracity, to relinquishing long-held beliefs and practices in favor of a whole new orthodox Jewish lifestyle - one she’d never imagined she’d lead. Having grown up with the influence of two sets of grandparents, one ardently religious and equally somber; the other, agnostic, humanistic and much more fun, Judy's journey was not without internal conflict. Accordingly, she depicts her courtship with ba'al teshuva husband Jeff and subseqeunt entree into the frum velt with honesty, humor and depth. Like Michael Medved, who wrote the forward for Judy Gruen's book, I can't claim to be objective about The Skeptic and the Rabbi. I'm even mentioned in the acknowledgments because Judy showed me an early draft! Her fans from Aish.com, The Chicago Tribune, The Wall Street Journal, and so on will find Judy's signature humor and brutal honesty combined with a less familiar pathos. Readers who have struggled to understand how a thinking feminist could choose of her own free will to enter the Orthodox Like Michael Medved, who wrote the forward for Judy Gruen's book, I can't claim to be objective about The Skeptic and the Rabbi. I'm even mentioned in the acknowledgments because Judy showed me an early draft! Readers who have struggled to understand how a thinking feminist could choose of her own free will to enter the Orthodox world will appreciate Judy's candor about her struggles. Especially refreshing is Judy's willingness to portray not only the things that have thrilled her about the Orthodox community, but also things that have caused her nervousness, discomfort, and even anger. Particularly touching is the lack of judgment she expresses about friends who chose not to stay in the Orthodox world, or who never chose to. A memoir about Orthodoxy that is both authentic and uplifting! Judy Gruen doesn't sugarcoat or romanticize her journey; she spices it with humor and self-reflection. Her straight-shooter style is both engaging and refreshing. Her story is inspiring without trying to be, and features several relatable moments, some of which made me chuckle aloud. I was captivated from start to finish. This book is thoroughly amusing, while also showing an honest portrayal of the struggles the author encountered on her path towards faith. It is humorous, heart-warming and an entertaining read. Grab a cup of coffee, a muffin, and set aside a few hours--you'll want to read it all at once. In an age when turning off your cell phone can seem countercultural, actually keeping the Sabbath may seem downright alien. But ironically, it's that dissonance that makes The Skeptic and the Rabbi: Falling in Love with Faith so appealing. Raised in a Reformed Jewish home, author Judy Gruen was quite comfortable living her upwardly mobile secular life. Granted, she'd grown up attending synagogue with her mother and maternal grandparents, Polish immigrants whose Conservative Judaism struck her as In an age when turning off your cell phone can seem countercultural, actually keeping the Sabbath may seem downright alien. But ironically, it's that dissonance that makes The Skeptic and the Rabbi: Falling in Love with Faith so appealing. Raised in a Reformed Jewish home, author Judy Gruen was quite comfortable living her upwardly mobile secular life. Granted, she'd grown up attending synagogue with her mother and maternal grandparents, Polish immigrants whose Conservative Judaism struck her as stern and joyless. But her family's religious practice extended little beyond Shabbos dinner on Friday nights and Passover with her Nana and Papa Cohen. Her paternal grandparents, Cece and Papa Rosenfeld, were even less religious; as Gruen describes them, they were good humanists whose "broadly intellectual, even cosmopolitan and fun life" appealed to her greatly. The tension represented by these strikingly different grandparents ultimately surfaces in Gruen herself. A feminist with all the usual liberal credentials, she nonetheless wants a more intimate experience of her own Jewish faith. "As a teenager," she writes, "I tasted occasional moments of spiritual uplift, moments that touched me and left me craving more." A post-bat mitzvah trip to Israel and a post-college graduation trip to the Soviet Union to reconnect with family only intensified this longing. "I lived in the freest country the world had ever know," Gruen recalls, "and I was determined not to squander that freedom but to embrace my Jewish identity fully." The Skeptic and the Rabbi follows Gruen as she does just that. Through her growing relationship with Jeff, who is also on a quest for a greater spiritual depth, she tests the waters of Orthodoxy--hesitantly, even disapprovingly at first, for by no means is this an overnight conversion. One by one, Gruen confronts the strictures imposed by this new Torah life, fighting a host of assumptions and misconceptions along the way. Writing with humor and astonishing candor, Gruen depicts a journey that is authentic and life-giving. It's a joy to accompany her on the way. What makes The Skeptic and the Rabbi so refreshing, beyond Gruen's ability to spin a good story, is its portrayal of an individual who is thoughtfully choosing her path, a path frequently at odds with the culture. Equally important is the utter freedom Gruen has to accept or reject the practices of a more Orthodox life. At no time does her community or her husband pressure her to make the choices they have made; she is left to follow her own mind and heart. Writing in the Foreword, Gruen's friend and sometime mentor Michael Medved wisely observes, "When an individual pursues a new religious path, she may hear angels singing or bells ringing, but it's the beginning, not the end, of her most important story. Any seeker who longs for a climactic resolution of all doubts and divisions, capped with the words 'and they lived happily ever after,' won't find such trite conclusions in religious congregations of any denomination." While offering the reader a greater understanding of Orthodox practices, Gruen's memoir can speak to a person of any faith--or even none. Indeed, the experience she describes could easily belong to a young Muslim woman who chooses to wear the hijab in defiance of her family, or a Christian who forgoes a lucrative career to work with the poor. At heart, this is a book about finding and claiming one's identity, about authentic choices, about embracing tradition out of love and not duty. Ugh. I was intrigued by the idea of a woman reluctantly moving into Orthodox Judaism, wanting more religious observance in her life but worried about the gender restrictions of Orthodoxy. Great concept. BUT. So many problems, the first of which is that Gruen keeps telling the reader what a good writer she is, which shows up by contrast just how NOT good a writer she is. (I probably wouldn't have minded the functional-but-no-more writing if she hadn't kept talking about her writing career.) She a Ugh. I was intrigued by the idea of a woman reluctantly moving into Orthodox Judaism, wanting more religious observance in her life but worried about the gender restrictions of Orthodoxy. Great concept. BUT. So many problems, the first of which is that Gruen keeps telling the reader what a good writer she is, which shows up by contrast just how NOT good a writer she is. (I probably wouldn't have minded the functional-but-no-more writing if she hadn't kept talking about her writing career.) She also keeps telling us that she's a humorous writer, but again, she's not. Plus, the title makes no sense; there are no skeptics here, and there is a rabbi, but I wouldn't have thought he would be a titular character. Then there's the bigger problem for me that she emphasizes repeatedly that the different strains of Judaism need to be open-minded about one another, somehow forgetting her own repeated digs at Reform Judaism! Really what she wants is for non-Orthodox Jews to make fewer assumptions about Orthodox Jews, and that's a fine goal, but it's undermined by the fact that she is more than willing to tell us that basically everyone is better than Reform Jews. This really pissed me off (I'm a Reform Jew, but I hope I'd be pissed off at this hypocrisy even if I weren't), and so I hate-read the book almost from the beginning. And then, reluctantly, I decided I had to give the memoir two stars instead of one, because normally I would have just ditched a book that I wasn't enjoying, but in this case I felt compelled to keep reading all the way to the end, getting grumpier and grumpier about Gruen but somehow not putting the book down. Grrr. Most books about Orthodox Judaism I’ve come across in the last few years written by women have them “fleeing” for their lives. This one instead is the story of how a Jewish woman embraced Orthodox Judaism when she never thought for a minute she ever would as a child or teenager. Ah, but then she hit her 20s in the 1980s and the author found herself still single and not wanting to be. She finally finds a great guy, but he was heading for the Orthodox life. Would she, too? Although Mrs. Gruen stro Most books about Orthodox Judaism I’ve come across in the last few years written by women have them “fleeing” for their lives. This one instead is the story of how a Jewish woman embraced Orthodox Judaism when she never thought for a minute she ever would as a child or teenager. Ah, but then she hit her 20s in the 1980s and the author found herself still single and not wanting to be. She finally finds a great guy, but he was heading for the Orthodox life. Would she, too? Although Mrs. Gruen strongly resisted at first, she then decided to learn a lot more about Orthodoxy, but eventually tried to break up with her boyfriend over the matter. There would be no breakup, though, and she would end up both married and Orthodox. Yet she made it crystal clear she would never wear a wig. Only, she does end up doing so; not after being pressured by anyone, but because she felt she needed to set a good example for her first child. She had three boys in four years and then a daughter. I have recently begun digging into the Jewish roots of my faith. I'm sure exactly where to begin I didn't know what to expect when I got this book but I was so quickly drawn in and it wasn't long before I finished reading this one. It's amazing how everything comes to life within the pages of this book. So many amazing things I learned simple details that weren't as simple as I once thought. And so many wonderful ideas I gained for myself as to how to move forward and live t Amazingly beautiful! Judy's memoir is such a refreshing book and the pleasurable read. The stores are flooded with memoirs filled with negativity, and finally somebody is able to talk about life challenges in an optimistic and encouraging way. It's beautiful to see somebody portray other people's beliefs in such a nonjudgmental way, while being very firm with their own. While reading this book you really get a full picture of the challenges and the beauty of Judaism in its most authentic expression. I'm sure this wil Judy's memoir is such a refreshing book and the pleasurable read. The stores are flooded with memoirs filled with negativity, and finally somebody is able to talk about life challenges in an optimistic and encouraging way. It's beautiful to see somebody portray other people's beliefs in such a nonjudgmental way, while being very firm with their own. While reading this book you really get a full picture of the challenges and the beauty of Judaism in its most authentic expression. I'm sure this will be a source of inspiration for so many people that are on a similar journey. I was definitely inspired by it, and I've recommended it to many friends. This author was raised in a Jewish household with contradictory influences from her parents and grandparents. I’m rather ignorant when it comes to the Jewish faith—having been raised Southern Baptist, but think I’m a lot like the author’s paternal grandmother, Cece! Gruen helps individuals (like me) better understand the sacrifices necessary to live a dedicated Orthodox lifestyle. I enjoyed the way she wove all her extended family members into this story, expressing concerns about some of the “r This author was raised in a Jewish household with contradictory influences from her parents and grandparents. I’m rather ignorant when it comes to the Jewish faith—having been raised Southern Baptist, but think I’m a lot like the author’s paternal grandmother, Cece! Gruen helps individuals (like me) better understand the sacrifices necessary to live a dedicated Orthodox lifestyle. I enjoyed the way she wove all her extended family members into this story, expressing concerns about some of the “requirements” she would have to embrace if she chose this stricter Jewish practice—and she has the ability to find the humor in her mistakes along the way. 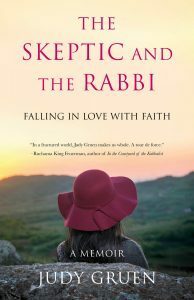 The Skeptic and the Rabbi is a beautifully written memoir about truly falling in love with your faith. Judy Gruen makes her memoir about embracing Jewish religious observances extremely warm and with a healthy sprinkling of humor. It can probably resonate with people from any faith. This is a very realistic look at Orthodox Judaism through the eyes of a woman who had many preconceived ideas. Easy reading, not one iota is preachy, rather it is a story of a totally normal woman. This book made me think deeply about my own religious choices. It is well written and honest about the good and the bad. As an active, committed, Reform Jew I really enjoyed Gruen's non-judgemental thoughts about people who take different religious paths. As a librarian, I think this book would be a wonderful book to discuss in a book club. When I heard about this book on Rabbi Lapin's podcast, I knew I wanted to read it. I am completely pleased with this book. The writing is enjoyable, with excellent vocabulary, appreciated translations to almost all Hebrew/Yiddish phrases and words, and tasteful humor. Mrs. Gruen shares a lovely story of her journey with so much wisdom woven throughout the book. A grateful reader thanks you, Judy. I love reading the trial and tribulations in deciding such a Jewish centered life. It's told with love and passion. Enjoyed the audio version of this warm narrative. This book actually reminded me a lot about living in Utah. I loved some parts. Other parts seemed overdone and annoying. I thought this would be much better. I loved her writing and the concept of the book but the truth is, it wasn't all that great. In fact, I put it down with 30 pages left unread. I can't remember ever reading something that had such a strong and immediate impact, something that I could resonate with so profundly and that would make me ask myself so many questions. One of the most heartfelt, relatable, and inspiring stories I’ve ever read! I will definitely be circulating this book amongst my circles! I wasn't super excited about it. The writing is fine and the subject material is interesting but it's not exactly the book of the century. Disappointing. I have always loved writing, and always will. My writing career began in health care public relations and expanded into writing cultural and political commentary, about Jewish spirituality, marriage and family, as well as humor. (I like diversity!) I've written three award-winning humor books, co-written a book on MBA Admissions strategy, and most recently, the book closest to my heart, my memoir, I have always loved writing, and always will. My writing career began in health care public relations and expanded into writing cultural and political commentary, about Jewish spirituality, marriage and family, as well as humor. (I like diversity!) I've written three award-winning humor books, co-written a book on MBA Admissions strategy, and most recently, the book closest to my heart, my memoir, The Skeptic and the Rabbi: Falling in Love with Faith. In addition to working on my books, my essays and features have appeared in the Wall Street Journal, Chicago Tribune, Boston Globe, Christian Science Monitor, Los Angeles Times, Saturday Evening Post, Orange County Register, Jewish Journal, Jewish Action, Aish.com, Ladies Home Journal, Woman’s Day, Family Circle, and Kveller. My work has also been published in 10 anthologies. Now, I am also working with clients editing their books and coaching them in their writing. It is immensely gratifying to help clients transform their vision into fine, finished products.